The 12 rooms at Surin Bay are pleasantly sunny and look and smell like they have just been cleaned top to bottom. Average rating 8.1 from 211 reviews. The standard rooms have one double or two single beds, making them suitable for both couples or friends travelling together. The luxury rooms also contain a living area with a rattan sofa set and balconies with an unobstructed ocean view. Rooms are by no means flashy but are comfortable enough, with satellite TV, safety box, minibar, hot shower and bath, and free WiFi. On our most recent visit in July 2015, a condo was under construction behind the hotel while the park area between the hotel and beach was being ripped up for a new water drainage system -- if daytime noise is a problem be sure to check when booking if these projects are finished. The downstairs restaurant has a kids’ menu and does popular Sunday roast dinners. Prices include breakfast. Recommended. 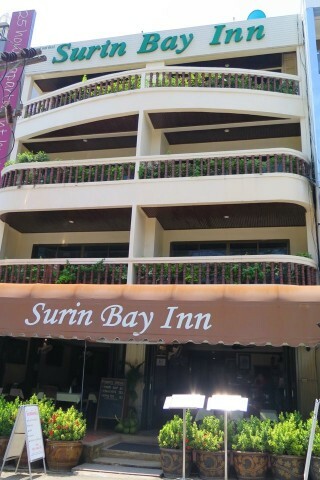 Check rates at Surin Bay Inn on Booking.com.